P. aurotaenia originates from Columbia. The aurotaenia is a smaller frog that does well in groups. The aurotaenia is also a bold and colorful frog with a beautiful call. 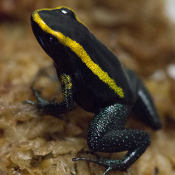 Like their larger relatives the terribilis, they are aggressive feeders and will tackle prey much larger than the typical dart frog (anything they can physically subdue in fact!). Frogs offered are captive bred adults unless otherwise noted.